Figure 1. Morreene Road Divided into Two Sections (right) and Morreene Road in Durham County (left). Credit: Map data © 2013, Google, North Carolina (http://goo.gl/maps/sytys). Students, residents, and other corridor users bicycling, walking, and accessing transit to Duke University and surrounding areas are faced with intermittent facilities that create hazards and difficulties, discouraging multi-modal travel on this corridor. 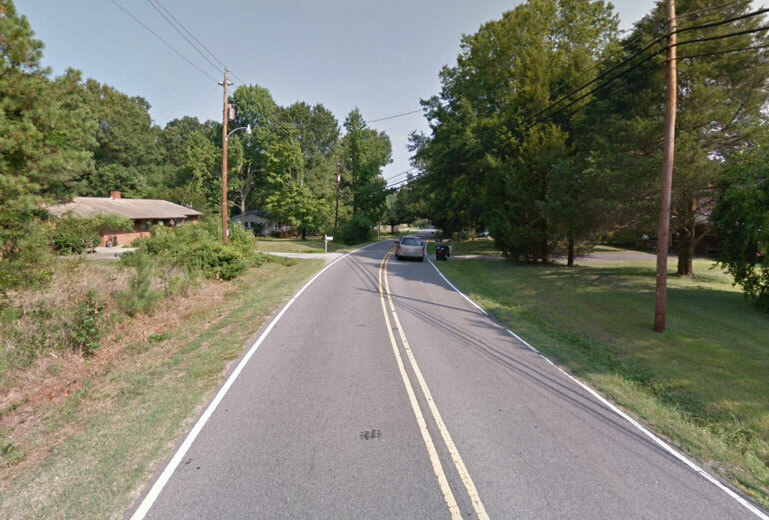 Morreene Road is currently in the planning process to determine recommendations for the construction of sidewalks and bike lanes that will eventually link Durham’s existing pedestrian and cyclist facilities. Both the DurhamWalks! Pedestrian Plan and the Durham Comprehensive Bicycle Transportation Plan recommend the Morreene Road Project. The Project is divided into two sections, Neal Road to Campus Walk Avenue (D-160) being 0.97 miles long and Campus Walk Avenue to Erwin Road (D-161) being 0.55 miles long. Figure 2. Heading Northwest Across Bridge over Highways 15/501. Credit: Map data © 2013, Google, North Carolina. The first section of Morreene Road, from Neal Road to Campus Walk Avenue, contains a wide overpass over highways 15/501 with wide shoulders but no sidewalks. 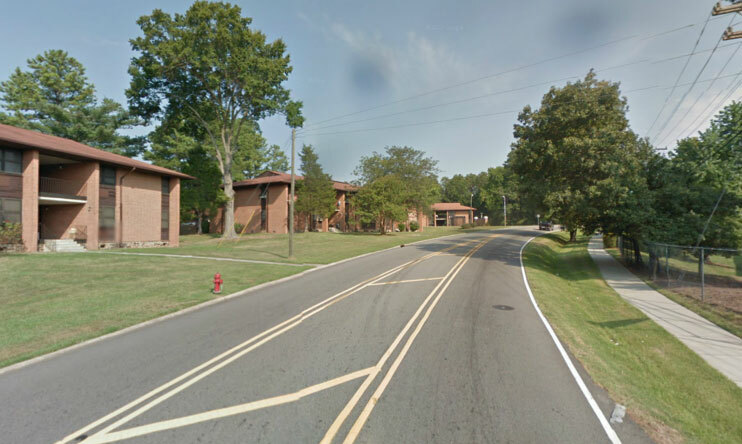 Heading north, the American Village community contains a mixture of single family homes, townhomes, and apartments. Throughout this section of Morreene Road, there are no sidewalks and minimal or nonexistent shoulders on narrow lanes that measure approximately 10 feet wide. 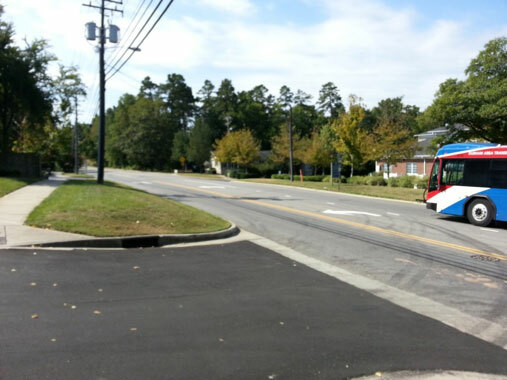 City transit (DATA) has few stops in this area and Duke University Transit does not serve this area. The second section, Campus Walk Avenue to Erwin Road, contains commercial, medical, and residential facilities. Along the corridor, there are low to medium density residential units and some low-income housing. Duke University is near the southernmost end of this route. Past the end of the study area in the south, Morreene Road becomes Towerview Road, a private Duke University road, after crossing southeast over Erwin Road. Erwin road is a multi-modal street with high volumes of motor vehicle, transit, and pedestrian traffic with some bicycling. Additionally, in areas further east of Morreene road on Erwin Road, there are higher densities of commercial and residential facilities. Figure 3. Heading Northwest on Morreene past American Drive. On the western side of Morreene, sidewalks are disconnected and intermittent. On the eastern side up Erwin to Campus Walk, sidewalks are continuous. This section of road has two lane and three lane cross-sections with no shoulders. Crosswalks are not marked and lane widths can be narrow with approximately 10 foot widths. There are DATA and Duke University Transit stops throughout this corridor. The DurhamWalks! Pedestrian Plan was adopted in September 2006 as the first dedicated pedestrian plan for the City of Durham. The Durham Comprehensive Bicycle Transportation Plan was also adopted in 2006, as an update to the 1993 Regional Bicycle Plan. 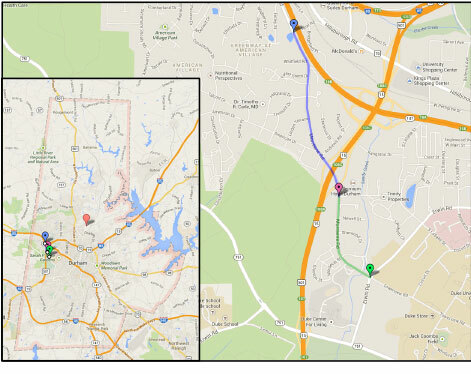 Both Plans call for pedestrian and bicycle improvements to this corridor as well as other corridors throughout Durham. Figure 4. Heading south on Morreene Road south of Campus Walk Avenue with local DATA Transit Bus. The City’s Public Works Department hired Horvath Associates to study four roadway corridors including Morreene Road from Erwin Road to Neal Road. According to the City, “this is a planning project only and no construction activity is currently associated with this study. The results of this study may result in recommendations for the construction of sidewalks and bicycle lanes.” The study began in March 2013 with surveying of the corridors and is scheduled to be completed in one year. A public meeting to describe the pedestrian-bicycle design process and allow residents to provide input was held in April 2013, and additional meetings are planned for winter 2014. The City of Durham and Horvath Associates initiated the design study agreement in November 2012. The study includes conducting public meetings during different phases of the design study. It also involves creating a topographic corridor map that locates all possible environmental issues and all utilities to help better determine costs for construction. Additionally, the consultant will create typical sections with various configurations for sidewalks and bike lanes, including the possibility of not providing sidewalks on both sides of the road. Finally, there will be cost estimates, permitting estimates, and an overall summary report that includes previously mentioned estimates as well as total project costs. Figure 5. Heading northwest on Morreene Road north of Mordecai Street. Funding sources for the project are from the MPO’s STP-DA (Federal Highway Program Surface Transportation Program Direct Apportionment) and CMAQ (Congestion Management Air Quality) funds. Horvath Associates will be providing cost estimates under their contract with the City of Durham. While the project does not call for road widening for motorist traffic, bicycle lanes may be added on both sides of the road, encouraging more bicycle usage. Pedestrian improvements may include new curb ramps, continuous sidewalks along the corridor, and crosswalk markings. Finally, transit improvements may include better stop locations and improved stop amenities. While still in the planning phase, these improvements would help to encourage much safer and easier multi-modal travel along Morreene Road. Figure 6. Facing northwest on Morreene Road north of Erwin Road. 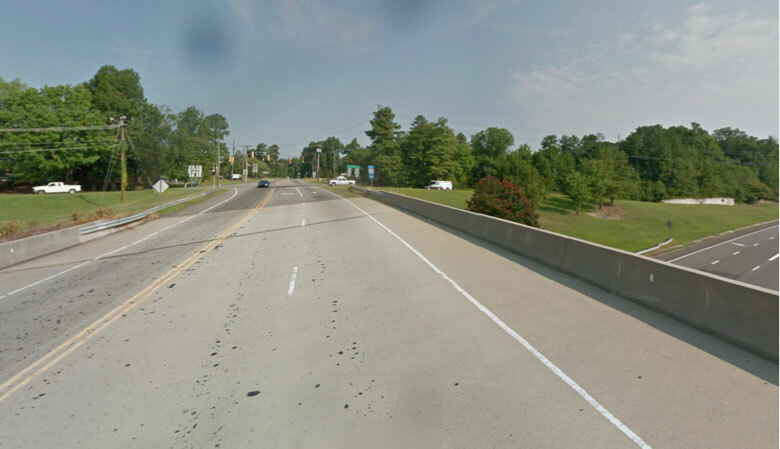 If the improvements are installed, Durham hopes to see improved ease and safety of travel of all users and greater utilization of the corridor as an alternative to driving, possibly leading to less congestion in the area. Nearby Erwin Road has many access points to Duke University and commercial districts. At the same time, users of Morreene road would have better access to local and regional transit connections up to and along Erwin Road. 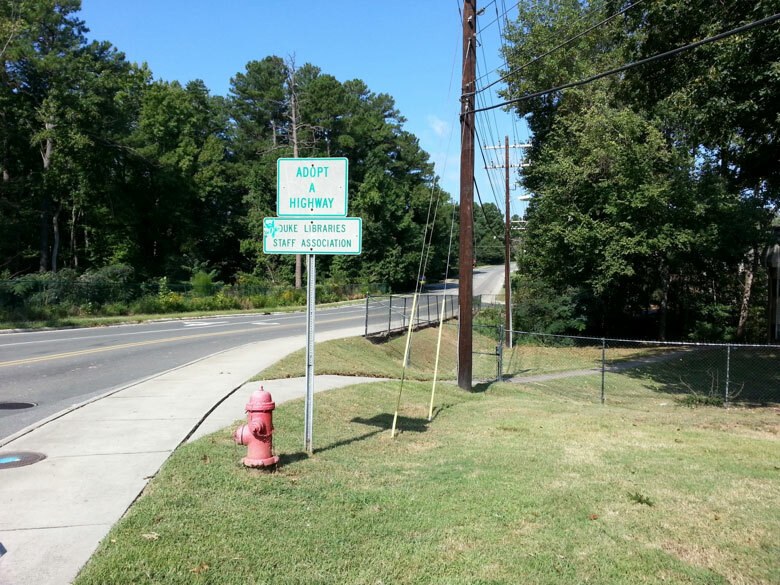 © 2019 Complete Streets NC | Site maintained by the UNC Highway Safety Research Center with support from NC DOT.